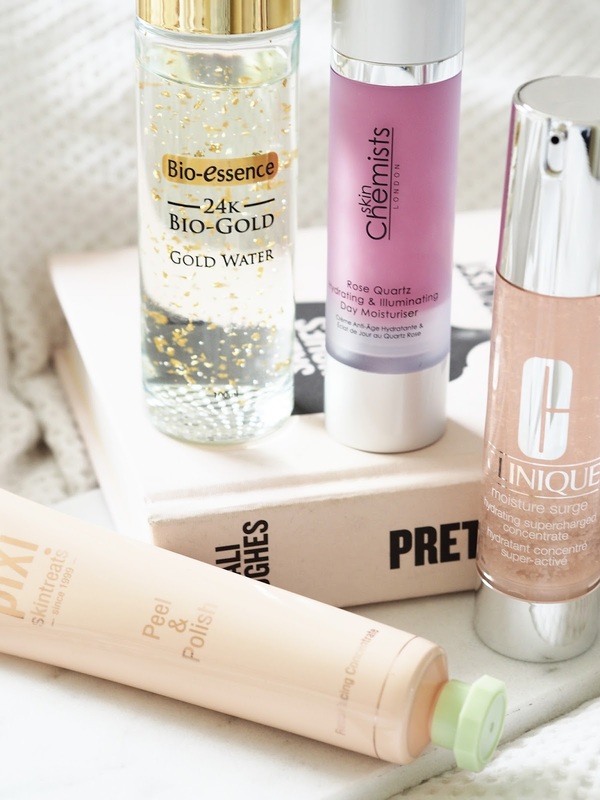 Trying out new beauty products is one of my favourite past times, if that's such a thing? I love discovering new brands, and there's also nothing more exciting than seeing what I think of a much hyped product. Here's a few products that I've been using lately and my thoughts so far. 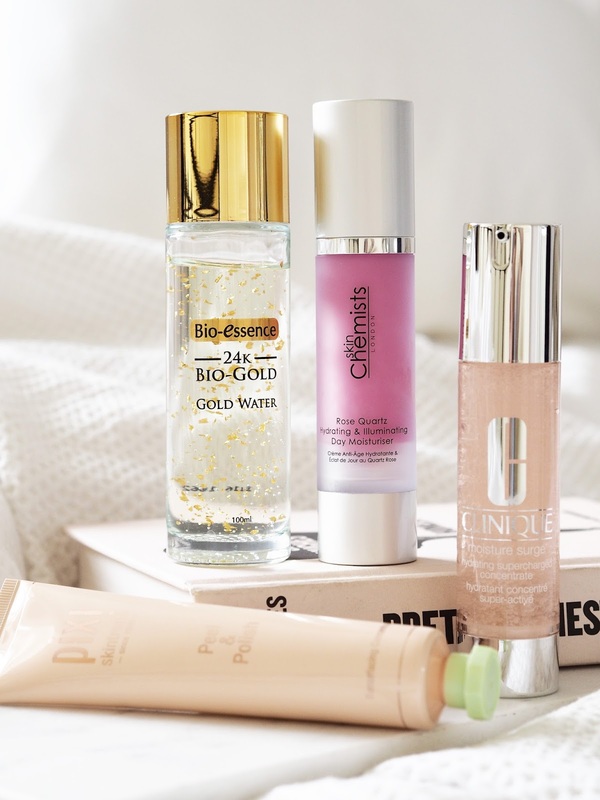 Bio-Essence 24k Bio-Gold Water* | I was super happy to get a bottle of this essence as it's really being hyped up at the moment. Sitting somewhere between a toner and a serum, this intriguing bottle contains real 24k gold flakes. Yes, really. Gold has been widely used in skincare over the years as it has anti-ageing qualities. 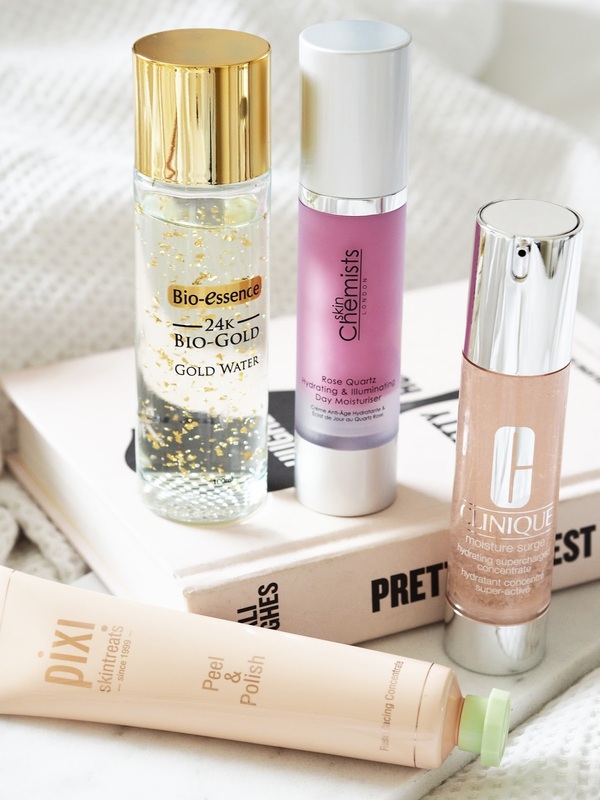 It's somewhat gratifying to smooth gold over my complexion twice a day, but even better to note that it's giving my skin a shot of hydration at the same time! It tightens pores, balances sebum production and plumps out the skin, making a great base for the rest of my skincare. Clinique Moisture Surge Hydrating Supercharged Concentrate | While the name is a bit of a mouthful, it does well to describe what this heavenly cylinder of pink bubbles actually does! This is the latest addition to Clinique's hugely popular Moisture Surge range which is best suited to dehydrated skins. 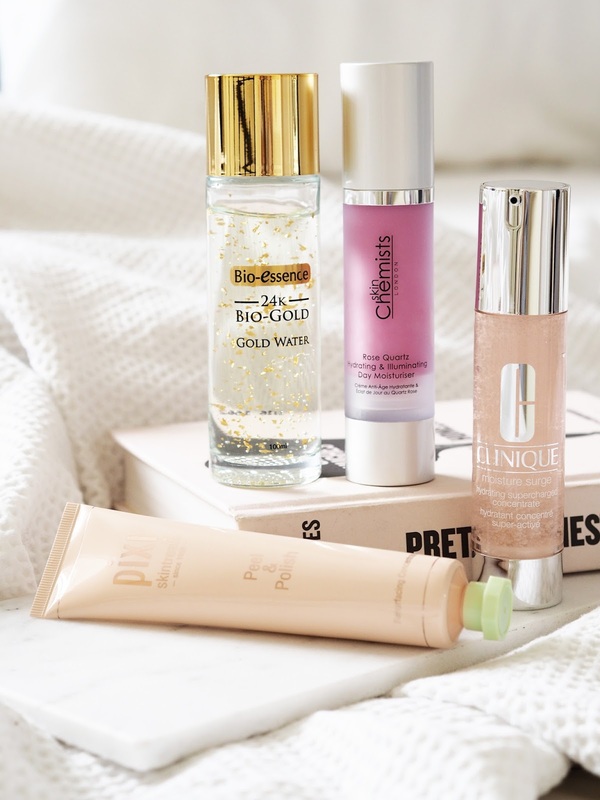 The gel sinks in very quickly, and as its light it helps build a little moisture sandwich on my skin along with the Bio-Essence Gold Water. I find that applying light layers of skincare in this way is perfect in the summer months as it doesn't overload my skin. The gel uses a technology which combines water-binding ingredients with antioxidants, so your skin is both hydrated and protected at the same time. Skin Chemists Rose Quartz Hydrating and Illuminating Day Moisturiser* | How beautiful is this pink moisturiser? I love anything with rose in it so I knew I was onto a winner from the off! It's ideal for dry, dull skin as it does add an element of radiance as well as moisturising the skin. It's another light formula so its working really well in my current skincare line up. It helps repair the skin from environmental aggressors and also benefits from Vitamin E which has anti-inflammatory benefits so if my skin gets a little too hot and irritated I definitely reach for this moisturiser. Rose otto oil not only smells amazing but it acts as an anti-bacterial as well as moisturising the skin. If you're out and about in the city (and pollution) on a daily basis like I am then this is a great pick to help protect and repair your complexion. Pixi Beauty Peel & Polish | Did I need a new exfoliator? No. Did I have to have this? Yes! Pixi Beauty never fails to impress me, and this newly launched and already very hyped up exfoliator is no exception. It uses fruit enzymes and lactic acid to gently loosen away dead skin cells, leaving your skin much smoother and brighter. It's also really easy to use so is great for a quick fix. It doubles up as a manual exfoliator too as it has little sugar particles to give it a little bit of grit, so it's a great introduction into enzymes and acids if you haven't used them before. It's really gentle so it doesn't aggravate my sensitive skin. Are you tempted to pick any of these up? The post Skincare I'm Currently Testing appeared first on Lelore. You can use this area to add any widget you want.